IN LONDON they queued for five hours and in Singapore buyers from around East Asia joined in the frenzy – all to reserve a bit of air. The air concerned is above 15 hectares (38 acres) in Royal Wharf, as marketeers have named the former docks. Two developers have joined forces to build flats, offices and shops for 20,000 people. The first phase offered flats off-plan at £235,000 upwards and townhouses from £695,000, some for more than £1 million. At the first offering, in London and Singapore less than a fortnight ago, more than 400 as-yet unbuilt homes sold within a day. Buyers came from China, Malaysia, Indonesia, Hong Kong and even the military-clique state of Myanmar (Burma). Property writers around the world have been rivalling one another to fling superlatives at the plans for the mini-city. “Docklands’ biggest new neighbourhood… 21st-century urban village… this giant vision… great regeneration… giant tract of land… awesome development” are just some of the phrases flourished by property writers for the Royal Wharf development at Silvertown, southeast of Canary Wharf. If you are a would-be buyer or renter despairing of the high prices in Hackney (hailed last month as the one of the 100 best locations in Britain, a “go-to destination” for the middle class), should Royal Wharf give you hope? The scheme would be completed within five years, “unlike some other large-scale London projects that drag on interminably”. Ballymore, working with Singapore developer Oxley, wants the first 800 homes on the former oil-plant site on the north bank of the Thames, near the flood barrier, ready by early 2016. Complaints by Londoners that affluent foreigners are inflating prices amuse indigenes in Spain, France and Italy, not to mention Cymru, areas that have suffered influxes of English second-homers and migrants over decades. 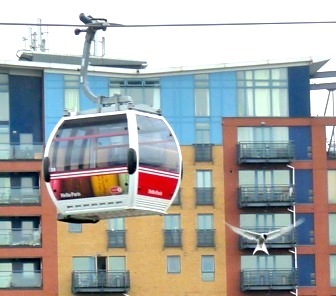 Royal Wharf is about 20 minutes from Central London by DLR train and close to London City Airport, with its flights to the Continent, and close to a cable car, with its access to South London. A good place to buy? Hmmm: already even estate agents are starting to call the London property market a bubble (one in which the biggest rises are in Hackney). And what happens to a bubble? * Top: Royal Wharf, the high-walled mini-city planned for the municipalised eastern banks of the river.